This home was at corner of Victoria and Madoc Streets, Marmora.The building was originally owned by Alexander George Loucks, b1822-d1898. Brickyard Owner. After George's death, the business, home and land was purchased by John William Nayler. 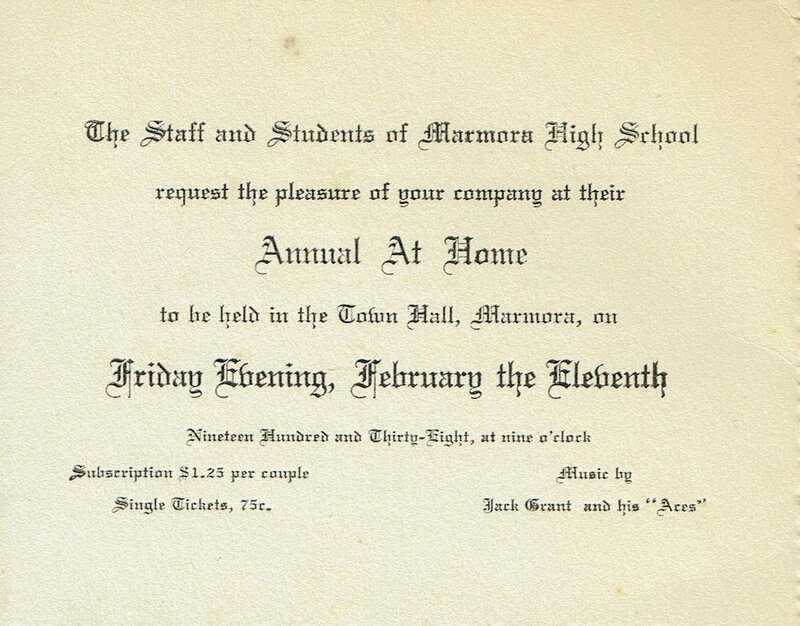 In 1920 the home was sold to the town to become Marmora's First High School, known as the "Continuation School". When the Loucks house was being altered to serve as a high school, the builders removed a large log house that may have been the former home of Mr. Loucks, but apparently was much older than the brick. In 1904 there was a large family named Leggett living in it, and some years later Thos. Downard and family occupied it. The building burned down in 1989, and has been replaced by a fourplex. The Marmora Pentecostal Church also sits on the original Loucks' property. The bricks used on this home, and others in the community, were fabricated by Loucks brickmakers and Nayler's brickworks. The kiln area for the brick manufacturing was just east of the Common Cemetery on the south side of Highway 7. The bricks were made from clay taken from the current "Nayler's Common Wetland and Trails". First year of operation. Building formerly owned by the Loucks family. 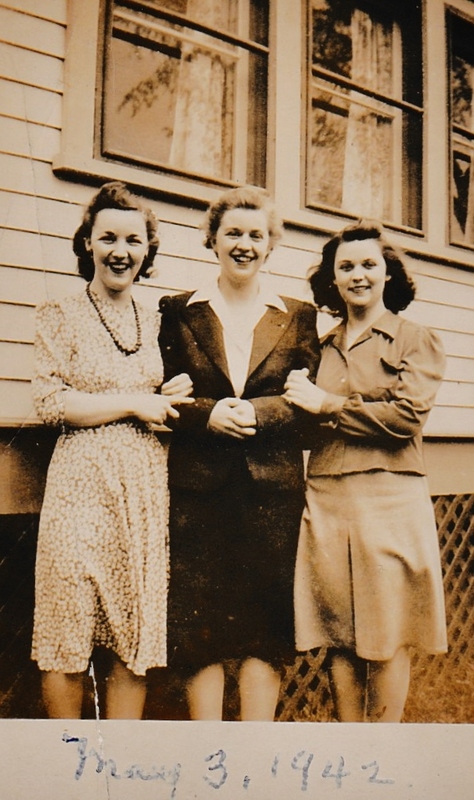 Miss Daley of Port Hope was principal, with Miss Steward B.A. of Consecon, as her assistant. 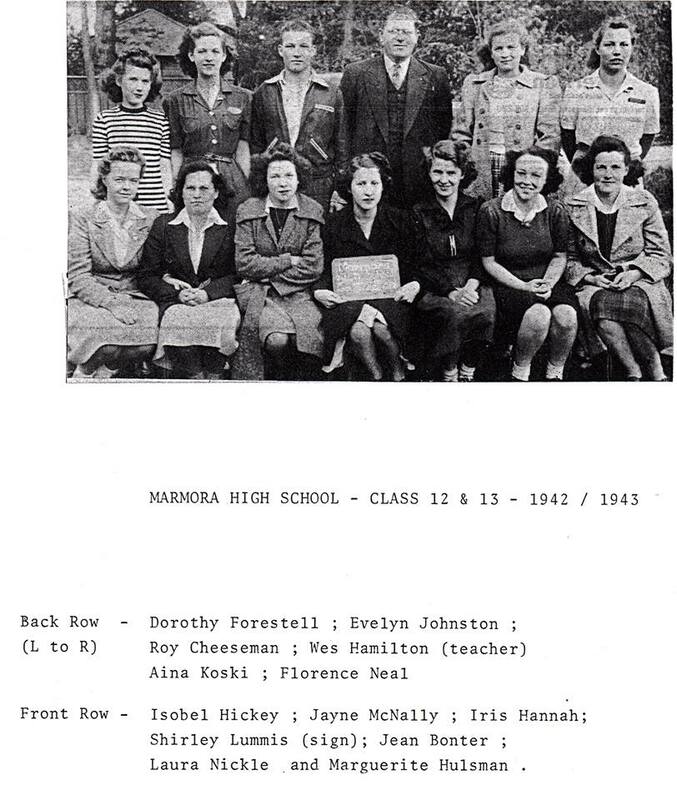 Dr. David Thompson was responsible as chairman of the Marmora School Board in the opening of a high school for the students of Marmora. Shortly after noon last Monday considerable excitement was caused in the Village when a fire alarm was sounded and it was discovered the New Continuation School was on fire. The blaze started in the basement, but the exact cause will probably never be known. The caretaker attended to the furnace about a quarter of an hour before the fire was discovered and everything appeared all right then. At first it was reported the boiler had blown up, but there was no truth to the rumour. One theory, which may be correct, is that someone had been smoking in the basement and dropped a match or a cigarette stub. The fire started in or near a pile of wood in the basement and the wood blazed so hotly it was hard to extinguish it. That it was possible to save the building at all was due to the good work done by the chemical engines and the fact there was a large cistern in the building and a deep drilled well just in the rear, which provided lots of water. Bucket brigades also carried a consider- able quantity of water from the neigh boring premises. The effectiveness of the engines is largely due to the action of the chemicals, which smothers the flames. Many times the quantity of clear water would not produce as great results. The lower rooms were badly damaged and the floor will likely have to be taken up and new joists put in. The basement door and steps will also have to be re- placed and the first form rooms will also have to be repainted and refitted. Quite a lot of equipment was either lost or damaged and many of the children had their books destroyed. The loss was estimated at about $1500.00, and the evaluator for the Insurance Companies, who was here yesterday, after going fully into the cost of repairs made a highly satisfactory settlement with the School Board for the sum of $1400.00 The necessary repairs will be rushed as much as possible. The most serious loss will probably be the loss of time to the pupils, who will be thus further handicapped in preparing for their examinations. Both teachers and pupils have been working under adverse conditions a good deal of the time. For a considerable time after 'school first opened carpenters and painters were at work in the building and after that there was the installing of the furnace. The Pearce Company helped celebrate the new school by offering two prizes for the best essays on the topic "Marmora Continuation School - is possibilities". The Methodist Minister and the Catholic Priest were to be the judges. Although the Herald reprinted these essays in full, the editor was not overly impressed with the. The first prize essay was dismissed as a "little overdone" and "too flowery". Submitted by Lillian Cronkright, it concluded that "The future of M.C.S. apears to be a wide, fair, fruitful field of hallowed labour, bounteous with promise and ready for all future reapers. How proud would the Fathers of our Community be if they could but know their dearest wish had been fulfilled." The Herald Editor complained that although the second prize winner had handed in an essay "without revision"t was much more to the point. The effect of the school would be, the writer said, that"People will think of the people of Marmora as well-educated people who delight in learning istead of an ignorant lot who care nothing about it." So pronounced a very young Jim Shannon. That year, the paper, which published everyone's marks on the front page, reported that Jim got an average of 78.5% in Form I. That put him very near the top of the class. (Editor's note: The following story was written for the Marmora Fair on Sept. 26 & 27,1921. It was found in a cardboard box on William Street by Bob Darby who was clearing brush at the time. Unfortunately the first prize winning essay does not contain a name and therefore no credit can be given to the writer. 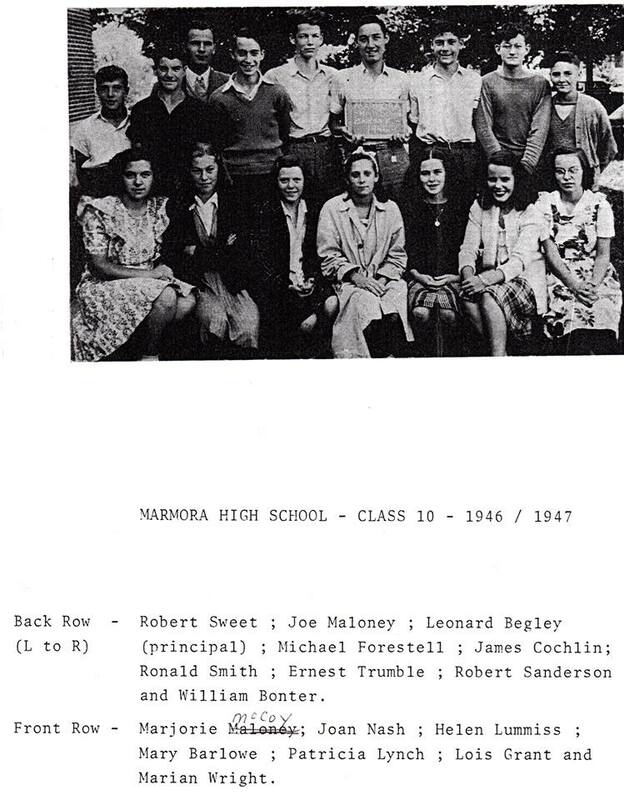 The Marmora Herald would like to thank Mr. Darby for bringing this to our attention, as it makes for an interesting piece of Marmora's history). "A little over a year ago saw the birth of a Continuation School in the minds of the council, school board, and citizens of Marmora. It had been a sort of far away wish of every man interested in education but the real possibilities had never been given any consideration. Before this, the Public school principal had taught forms one and two but it was very hard for him to give them the attention that they would receive in a high school. On Madoc Street there was a large brick residence which was going to wrack (sic) very quickly from want of repairs and from careless tenants. The owner determined to sell it away below value to get rid of it. This was the way the Continuation School board obtained such a cheap building. As soon as this offer was heard of, a delegate was sent from the school board and the council to the owner of the building. He purchased it and gave a cash payment for it to hold it. All this was done in so short a time that the councillors and members of the school board had hardly time to think of the great venture they were making, but they had the building on their hands in a place where it was practically worthless value, so they could hardly back out. Therefore, work was immediately started on re-modelling the building and tearing down the many buildings attached to it. The first year was started amid great hardships. The teachers and pupils were continually bothered with the sounds of hammering or some other annoyance caused by the unsettled school building. The attendance was just about right for the size of the school and everything went well for some time. Then came another great trouble -- the fire. The pupils had hardly got away from school at noon-hour when the alarm of fire was given. Smoke poured out from all the doors and windows in great puffs . For two hours or more nearly every able-bodied citizen fought furiously to save what was worked so hard for. At last the smoke died out but it leftnot the lovely decorated interior but rooms brown with smoke and with the woodwork and decorations chopped with firemen's axes and flooded with water. The school was insured enough to cover the loss hopefully but it meant loss of time for pupils and worry for school board and teachers. It was soon re-decorated, however, and looked even better than before. The end of the year soon came and the results were very good considering the trouble and loss of time. This year though promises to be better because of most of the pupils being in the school a year, and because the teachers will not have to work under such difficulties as before. One would think that this school had had enough worry and trouble but this was not the case. This year the school board were confronted with the fact that they had a school which should hold about fifty pupils while they had applications for seventy-five or eighty. A meeting was held and two remedies were suggested. One was to put form I in the Masonic Hall for the year and the other was to tear away the partition between the two cloakrooms thereby making another room. The last one was carried out and was a great mistake. Even then it would not seat all the pupils with comfort. The first mentioned remedy was then used and the first form are now in the Masonic Hall. If the following year and a half are as full of trouble as the past year and a half the school board will begin to think their efforts in vain, but it is to be hoped that things will go more smoothly from now on." Watching 'NEWSMAGAZINE on T.V. Monday evening, January 30th, we were surprised to see a program about Marmora, and the closing of the mines. The closing .of an industry is, unfortunately, common news these days. But the reaction of the people of Marmora was uncommon. 1t was dignified, and strong, and proud. "We'll 'make out somehow." said one. "Marmora will come back." said another. "Something will turn up" from a third. Not a single bitter, complaining statement, not a sullen face. Now that's Canada! That's pioneer material! Marmora, we're proud of you! ceiling of each room, a door- knob (up-stairs) that came off in your hand if you were not careful, and the hall closet, where the Deloro students ate lunch in winter. And were we PROUD of that school! system. Twice a day we would hire ourselves out, come sun, rain, sleet or snow, and exchange rooms. There was a short cut, and I would meet Pearl, hurrying north East past the bramble bushes to teach History to my classes while I rushed' South West down to the Public School for Art or French with her classes. (I hope I have the directions right.) Mr. Gale had all the Math and Science then, and he too shuttled back and forth, his coat-tails whipping in the breeze, intent on keeping the system moving as fast and efficiently as possible. We never thought of any incon-venience. The brisk walk was quite exhilarating, and the classes were always ready and waiting (if laughing) when ... puff, puff ... teacher arrived. Those classes were a joy. I had gone to my first day, outwardly smiling, inwardly quaking in my shoes. There are few crises as over-whelming as meeting ... facing for the first time, the silent group of 35 pairs of eyes, 35 waiting tongues, 35 varying personalities, off-set by one! I was alone. I was a stranger, vulnerable, and afraid. But you were delightful teenagers. No wonder you, and your children, have grown up into the Marmora of today. Remember those French classes, Leo O'Connor, Ronald Regan, Ross McCall? And our studies of Guy de Maupassant, and Alphonse Daudet? ... Why, AnnePaquet and Margaret Shannon ... You could translate so fast, your tongues stumbled over the words. Remember the Art classes Gus Leonard, Eugene Reynolds, Francis Hollingsworth," Richard Gale, Bob Lumsden ... and all the others? It took 5'/2walls to show our display on Parent's Night ... And that didn't show all the fun it had been making them.. .I have treasured that hand-painted Christmas card, Donnie Prentice, for years and years. . Remember the Latin classes, Hilda O'Connor, Mary Paquet, Jack Shannon? We conquered with Caesar, and sang "Arma, virumque cano", with Virgil. Near exam time we would have review classes in Mr. Gale's room' after school. You were very good at the poems, MarionSweet ... except when Pat Bertrand came peeking in the window waiting to walk you home. Remember the hockey practices, Floyd Loveless and Bert Kouri? Marmora had no skating rink ... but I had that little green "coupe" . The whole team would climb in (or on). If you hung on tight, the running boards made fine transportation, and off we went to the Deloro rink. I can think of me laughing time, when a hockey player, stick and all, tried to ride, sitting on the engine ... but that proved too cumbersome. We stopped, he slid off, and somehow squeezed into the rumble seat, already crowd- ed, and off we went again. Our team (with no subs whatsoever.) did very well, didn't we? She's as stupid as she looks. "Ah, but a man's reach must exceed his grasp, Or what's a heaven for?" "That cousin s whistle once again?nnWell •... go. my love." During recess, the day we finished Andrea, I was sitting on the window-sill enjoying the sunshine. when your voices carried up from the grassy yard below and I heard: . .
_Y'know ... I don't think that was her cousin at all. - It was her boy-friend. _ Sure ... But don't tell Miss Farley, She doesn't know. And the hilarious part is: You were RIGHT! I didn't know. Isn't that funny? titles I could find. "The Mystery of the Dark Cavern" .. "The Loss of Eastern Pearls." .. "The Ghost in the Tower" etc. last, near the end of the period, some-one came up and asked: "Could I borrow that book?" "Oh NO," I said "I want to finish it tonight. But.." as she turned away, "you may have one of the others, if you sign for it and promise to bring it back." "Oh I will." she said. and signed a page, (oddly enough left handy) and went back to her seat to happily check her new book. In a few minutes all the books had been taken! reading?" I smiled. To his satisfaction, and to the utter amazement of the class, I brought out my list of signatures, and assured him that we were well ahead of average. Oh, of course, after he left, I got a few snickers and snorts, and remarks of "Ever a dirty trick" ... but actually, it was fun, and we all knew it. And he gave us an excellent report. Joyed in the pride and pleasure of his car. And say to all the world: THIS WAS A CAR!" Remember the Christmas party, the night of the big storm? The wind blew wild, and the snow was knee-deep, but we went anyway. It was great to close the door on the howling blizzard. and join the warmth and light and laughter of your friends. Remember the teddy bear, Norman O'Neill? Thank you all for a beautiful evening. Well. I think I shall finish this all-too-long reminiscence by going back to my first week in Marmora High School. Those first trying days, when a teacher's attitude is formed, his career made. or broken. I remember the turning point very clearly. , It was a Latin class (a very good Latin class) studying deponent verbs. Utor, to use. was one example. I put several sentences on the board to illustrate and among them was: The Roman used his sword. Romanus gladium usus est. A watchful sort of silence in the class. I was so nervous. that, after discussing the verb tenses, I walked slowly to the back of the room.so no-one would see that I was shaking. As I passed your desk. Bert Kouri, you lightly touched my dress. and whispered: "Utor takes the Ablative". In that instant the whole world changed. I knew the class was with me. "Thanks" I whispered back ... and walking to the front calmly now, I changed the noun "gladium" to "gladio, the Ablative. I'm sure that every student in that room knew that it should have been "gladio". You had an open door: a chance to humiliate the new teacher •... to show how smart you were ... to stand up and announce "Please, Teacher ... You got it WRONG." and wait for the ridiculing laughter. But you didn't. Instead. a quiet whisper told me: "Utor takes the Ablative." Such consideration is never forgotten. The tone was set. We had four wonderful years together. We drew charcoal castles. and put on French debates; we argued English literature. and studied Latin Composition; we passed tests and exams. and won ( or lost) hockey series. Most of all. we enjoyed the sunshine and the rain. and one another. I'm sure you have gone on and enhanced the world since. Thank you. students• '''Marmora High. 1934 to 1938•.. and citizens of Marmora, too. May the years touch You lightly ... you and your children ... and the joy be yours.